Alter 75 J. 3 M. 10 T.
Alter 78 J. 14 T.
Des Lebens Muehr ist vollbracht. Translation: Katharine Weinmann, died 13 December 1907, age 75 years, 3 months, 10 days. 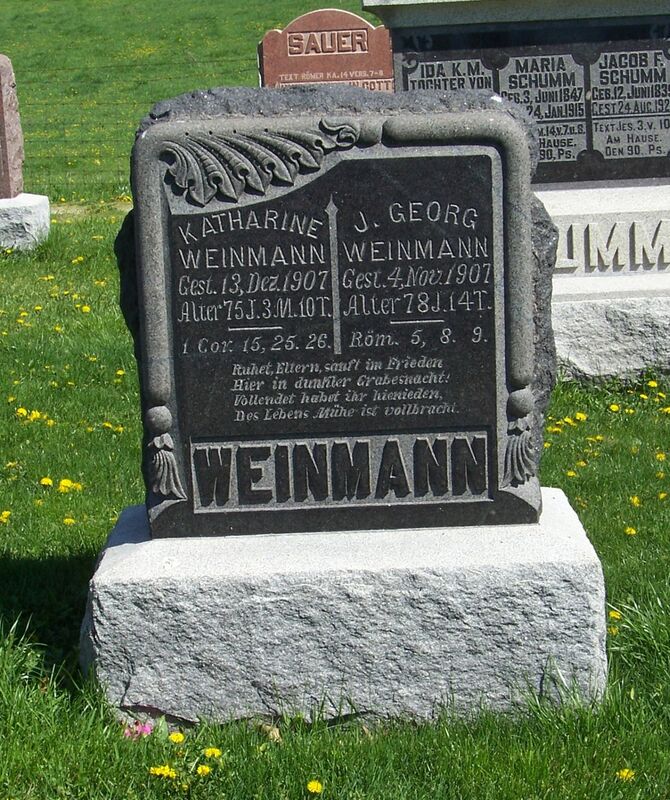 J. Georg Weinmann, died 4 November 1907, age 78 years, 14 days. Here in dark Grave Night! According to Zion Schumm’s records, Johann Georg Weinmann was born 21 October 1829 in Obermodern, Elsass. His wife Katharina (Karcher) was born 3 September 1832 in Schillersdorf, Elsass. Both places are in northeastern France. Johann Georg died 4 November 1907, at the age 78 years and 14 days. He was buried on the 6th. The church records note that he was buried after a Christian service. He was survived by his with Katharina and son George Weinmann. His widow Katharine died of pneumonia in Schumm less than a month later, on 13 December 1907, at the age of 75 years, 3 months, and 10 days. 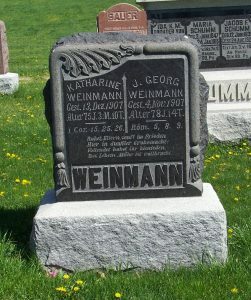 She was buried on the 15th and was survived by her son George Weinmann. 1900 U.S. Census, Willshire, Van Wert, Ohio, ED 97, p.10, dwelling, 207, house, 222, John G Wyman; Ancestry.com (https://search.ancestry.com/search/db.aspx?htx=List&dbid=7602&offerid=0%3a7858%3a0 : viewed 2 Jul 2018). 1900 U.S. Census, Willshire, Van Wert, Ohio, ED 98, p.11, dwelling 218, family 223, George Weimann; Ancestry.com (https://search.ancestry.com/search/db.aspx?htx=List&dbid=7602&offerid=0%3a7858%3a0 : viewed 16 Jul 2018). Note by kmb: One J. Wineman owned about 70 acres of land in Section 3, Liberty Township, located on the northeast corner of Tama and Wabash Road, with their house off Tama Road. This was a different family because this land was still owned by Wm. Weinman about 25 years later. This Weinman family attended Zion Chatt at one time and the wife’s name was Rosina (Weinman). I do not know if they were relatives of the Weinmanns who moved to Schumm. 1880 U.S. Census, Liberty, Mercer, Ohio, ED 188, p.472C, dwelling 18, family 19, John G Weinman; Ancestry.com (https://search.ancestry.com/search/db.aspx?htx=List&dbid=6742&offerid=0%3a7858%3a0 : viewed 16 Jul 2018). Thank you for posting these items about the Weinman and Gunsett families. 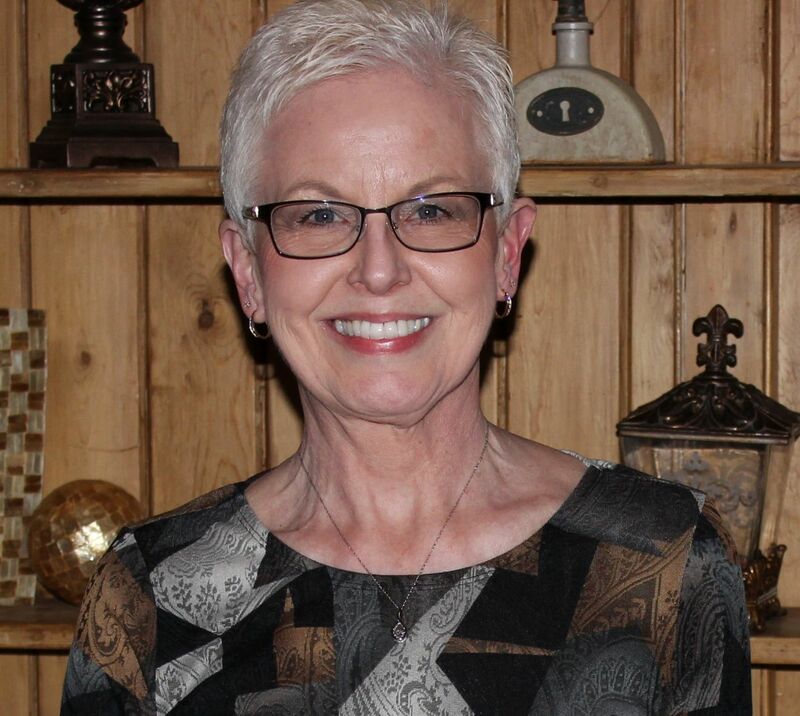 As you probably know, my mom’s maiden name was Weinman and she tells stories about her grandfather who ran the post office and store across the road from the house she grew up in Schumm. I believe he also ran a huckster wagon. She has been enjoying reading your posts, too. Thanks, Deb! Glad you and your mom enjoy reading them.